Karen House : Feb. 8, 2019, 12:43 p.m.
Dr. William Childers shows how the new refillable water stations work. 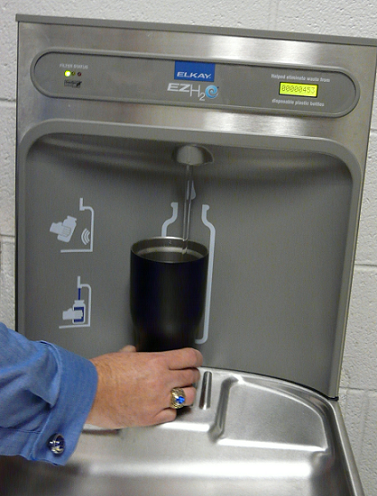 Feb. 8, 2019 – Griffith Elementary students now have an easier way to fill their water bottles. 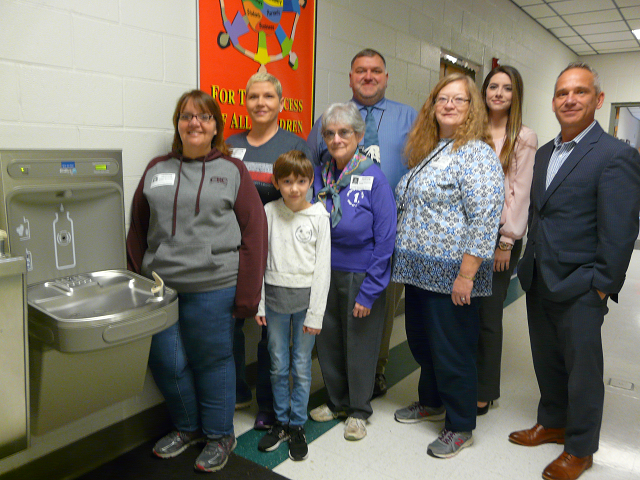 A cooperative effort among the state of Tennessee, Step Up Sequatchie, and the Sequatchie County School System resulted in the installation of three refillable water stations at Griffith. Two of the water stations were funded with part of a $5,000 grant Step Up Sequatchie received from the Governor's Foundation for Health and Wellness, as part of the “Healthier Tennessee Initiative.” The third was bought by Griffith's Parent-Teacher Organization (PTO). Although the stations were installed over the Thanksgiving break, the official dedication was today, as Dr. Childers was joined by the Initiative's Regional Director Russell Cliche, Health Educator Tristi Bond (SE Regional Office of the state Health Department), and several representatives from Step Up Sequatchie. Dr. Karen Shepherd recalled the first time she ever saw a water station like this was at the Atlanta airport. Anything containing liquid was not allowed through the TSA checkpoint, so she had carried an empty water bottle in with her and once through the checkpoint started looking for a water fountain. “And there was a water station!” she said. The new water stations are equipped with a filter and a counter, which today showed it had been used over 400 times. Cliche congratulated Rolanda Green, the health supervisor for the school system, for suggesting a grant be used for the purchase of the three water dispensers for Griffith. Sherry Cagle, who works for the state Health Department and is active in Step Up Sequatchie, also thanked county officials for allowing the grant money to be funneled through them for this use. Step Up Sequachie members joined Dr. Childers and state officials in dedicating the new water stations. L-r are: Kellee McAnally, Audria Lewis, Brailey Lewis, and Dr. Karen Shepherd of Step Up Sequatchie, Principal William Childers, Health Dept. Community Outreach Representative Sherry Cagle, Health Educator Tristi Bond, and Russell Cliche, regional director for the Governor's Foundation for Health and Wellness.